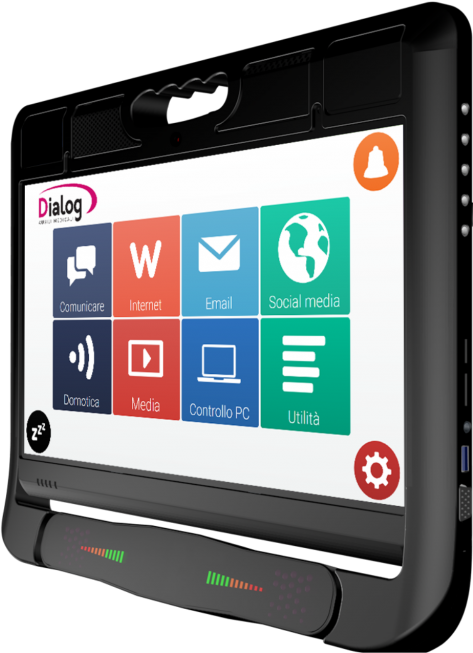 The new Dialog 3.0 EYETRACKING communicator has an advanced direct binocular pointing system that allows for alphabetic communication and Windows PC management by using only the movement of the pupil. The Dialog 3.0 Eyetracking communicator is equipped with a powerful third generation I7 computer capable of processing without limitation each frame the eye-tracker inputs, guaranteeing 60 fps without discarding any. The Dialog 3.0 Eyetracking communicators have all standard accessories. Integrated home automation module, interchangeable shields for touch accessibility, built-in 5-port switch for connecting sensors. The Dialog 3.0 Eyetracking system uses the brand-new Dialog Ausili S.r.l. eye pointing system alongside hardware improvements in line with IEC 60601-1-1 and 60601-1-2 standards. It is recommended for users with moderate movement disorders, for patients with compromised neuromotor abilities that only allow for some weak residual movements, patients with ALS, patients with quadriplegia with severe difficulties in their upper limbs and patients with severe trauma. Dialog 3.0 EYETRACKING was designed to respond to the gradual and continual worsening of vertical eye movement in cases of ALS. A 1366×768 pixel resolution allows the user to reach the entire visual area effortlessly. This system is also recommended for people with language and writing problems. The advantage given by compensating head movements guarantees the system high stability margins and means it can be used by individuals with severe dystonia. Since it is a portable device, it can be easily transported, and by adding a stand can be attached to a wheelchair, thus favouring communication anywhere. Dialog 3.0 is a communicator created to personally meet the needs of patients with diseases such as ALS. The production criteria were evaluated depending on intended use, that is, on the directives and standards to which a Medical Aid must comply. The Dialog 3.0 Eyetracking communicator allows for communication by using high phonetic quality male or female speech synthesis. You can configure the synthesis as required through various parameter settings (speed, clarity etc. ), reproducing letters and sentences typed with the eye pointing system. Communicator accessibility is determined based on the client’s physical characteristics. If the user has upper limb motor movement, s/he can use the communicator through the touch screen. Where there are residual motor movements in the upper limbs, it is possible to use the communicator through the switch sensors. Where the user has good head movement control, s/he can use the communicator through a head movement tracking software through the use of the built-in webcam. Finally, if the client does not have residual motor movements that allow him/her access to the communicator through the above systems, s/he can use the Deye eye-tracker included. The Dialog 3.0 Eyetracking system also includes the Deye eye-tracker, a binocular eye-tracker. It is an eye pointing system that tracks the movement of both eyes. Thanks to Deye, individuals with extremely limited residual motor abilities can translate their eye movement into regular mouse movement, allowing them to use all the functions of an electronic computer. In addition to guaranteeing electrical safety, reducing the residual risk to a minimum and favouring adequate resistance to impact, the materials used make the communicator light and functional. Thanks to its characteristic handle, the communicator is easy to transport. The Dialog 3.0 Eyetracking was produced with the aim of being easily positioned with specific stands. It has no sharp corners or visible screws (fundamental characteristics for IEC 60601-1-11 standards). Interchangeable Grids: shields can be placed onto the display to facilitate touch screen use for individuals with motor difficulties. Patented system. Built-in Switch System: 5 inputs – compatible with all commercially available sensors and completely programmable. Battery: Interchangeable lithium battery to guarantee use outdoors. Product Sanification: Thanks to the advantage of being produced in Italy, in the case of transferring the Device to another patient, our company will refurbish the Dialog by replacing all its external parts. Dialog 3.0 Eyetracking is a portable system thanks to its reduced weight (2.3kg including eye-tracker) and to the numerous stand combinations. Dialog is also a versatile system thanks to its internal battery. Augmentative and Alternative Communication Software: Dialog AAC – Speech Synthesis Communication Software – Antivirus – Others personalisations based on the patient. The Dialog 3.0 Eyetracking EMD is registered at the Italian Ministry of Health as a “Medical Device” with registration No. 1453396 and is registered in the medical device directory with registration No. 1453396/R. The above device was classified as belonging to Class I.